IT WOULD BE EASY, on a first hearing, to pass off Wolfgang Haffner’s Kind of Cool as bog-standard ‘elevator music’, given his assured, easy-going approach to this stream of jazz favourites. But offering so much more than that, he presents a thread of accessible Summer’s afternoon ‘cool’ in immaculate, straight-ahead renditions including So What, Summertime, and My Funny Valentine. As a jazz drummer, composer, producer and bandleader, Haffner has for many years been highly regarded throughout his native Germany and beyond – indeed, a weighty back catalogue of recorded and live collaborations (including Pat Metheny, Michael Brecker, John Abercrombie, Michael Wollny) tell their own story. Recalling his early introduction to jazz, it was the LPs of Dave Brubeck, Art Blakey’s Jazz Messengers and the Modern Jazz Quartet that helped Haffner forge his musical identity; and here, he approaches familiar ‘greats’ with a fresh elegance, along with a trio of his own compositions which neatly dovetail into the prevailing chilled groove. A sextet album with guests, the main line-up boasts extraordinary collective experience: Christopher Dell (vibes), Jan Lundgren (piano), Dan Berglund (bass), Dusko Goykovich (trumpet) and Jukka Perko (alto sax), plus Haffner at the kit. 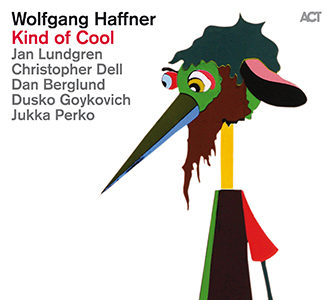 So a few pointers: Haffner’s gently shuffling Hippie, with Jukka Perko’s mellow alto conjuring thoughts of Paul Desmond’s (Brubeck’s) signature sound, leads to a buoyant, vibes-embellished interpretation of Miles Davis’ So What. The only vocal track finds soulful Max Mutzke (in an impressive first take) easing into Billy Eckstein’s Piano Man, with marvellously measured blues piano from guest Frank Chastenier; and the timeless appeal of Autumn Leaves is longingly windswept by Dusko Goykovich’s muted trumpet. Tantricity (from Haffner’s pen) meanders abstractly before a welcome gear change in Summertime – Gershwin’s spiritual reinvented as a catchy, laid-back swing. Rodgers & Hart’s My Fully Valentine maintains its slow, haunting mystery thanks to Perko’s silky alto; and the cheeky unison horn demeanour of Nat Adderley’s One For Daddy O swaggers to the velvety trombone of guest Nils Landgren. With reminiscences of Chet Baker’s smooth vocal delivery, I Fall In Love Too Easily smoulders to Goykovitch’s soft trumpet and Jan Lundgren’s pianistic grace. John Lewis’s Django takes a new twist away from MJQ familiarity, its inquiring sax melody entering the realm of TV drama theme; and Haffner’s Remembrance is a fitting bookend, every bit as appealing as its classic companions. A recording occasionally veering close to soporific in places, the similar key-change oscillations of the first two programmed tracks didn’t initially help to grab the attention (though perhaps Wolfgang would be quite happy with the Miles comparison!). But as the album proceeds, there’s the realisation of ordered clarity and sophistication which becomes increasingly satisfying. Maybe not literally “my favourite work of art”… but, having already received many enjoyable plays, it will no doubt be pressed into action as the long (hopefully warm and sunny) days of Summer approach. Released on 23 February 2015, further information, audio clips and purchasing can be found at ACT Music.